Dressed up for trick-or-treat street! This was the day Daniel was diagnosed with strep, so I took the older kids and Brian stayed home. I’m pretty in love with the crown that came with Kalena’s costume. I think it’s the crown that makes it clear she’s Glinda the Good Witch and not some random princess. Her costume didn’t come with a wand, but I think the one from the $1 bin at Target fit the bill nicely. Will’s parrot costume is a size 2-3T which is great, except that the hat is also 2-3T. Will’s head? Decidedly bigger than that. I ended up cutting a slit in the back and inserting a panel of knit material so that he could get it on. (Sized it on my head while I was sewing. Fit perfectly.) He was looking at the camera in zero of the pictures I took. On Halloween kids were allowed to wear their costumes to school, but we didn’t think the Glinda dress would be very conducive to playing on the playground. Plus, no accessories, so the wand and crown would have to stay at home. 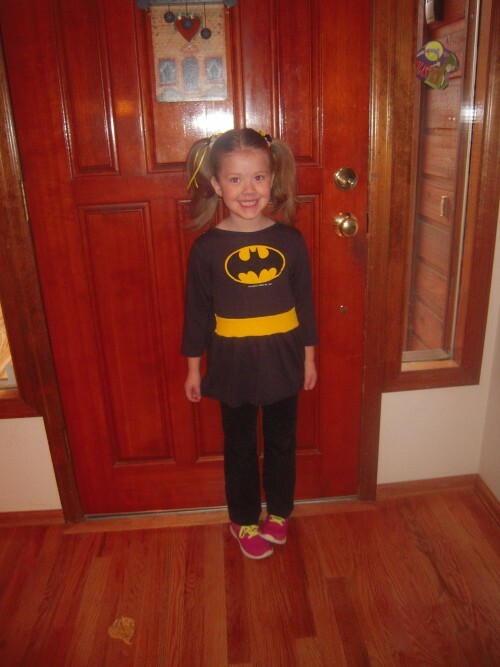 Instead, we dug this batgirl costume out of the dress up bin! It was mine from when I was in first grade. 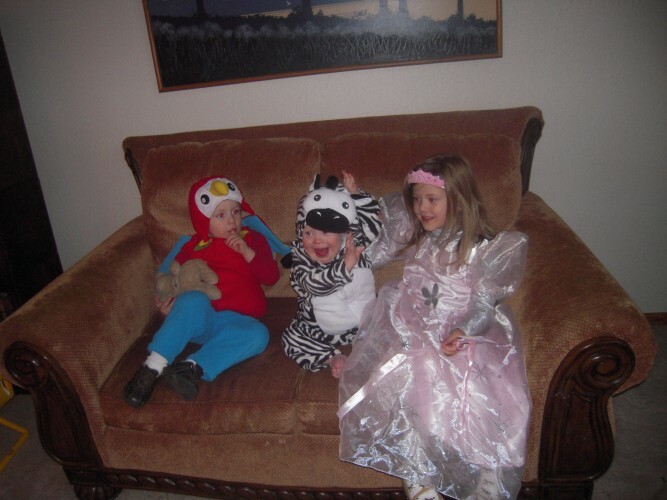 Then Thursday evening we got the kids all dressed up to go trick-or-treating! Kalena refused to wear the big crown because it made her head sweaty. Fortunately I’d picked up a $1 headband crown to go with her $1 wand, so she wore that. And she took that off about 2/3 of the way through trick-or-treating. Girl doesn’t like stuff in her hair. This is the one happy picture I have of Daniel. When I bought the kids costumes for Halloween this year, I figured they’d be wearing them 3 times each: once at our church Halloween party, once at trick-or-treat street (put on every year by my mom’s school), and of course to trick-or-treat on Halloween. But then Kalena was diagnosed with strep the day of our church Halloween party so that got nixed. Daniel was diagnosed on the day of trick-or-treat street so he missed that. (Those were really what I intended HIS costume for since they were both indoor things.) And actual trick-or-treating was going to be cold and late, and he made this face a lot after we put on his costume so he ended up staying home from that too. Good thing I bought him a costume, is what I’m saying here. Parrot!! I thought we’d see those everywhere, since Old Navy had only three options, but surprisingly Paul was the only one around our neighborhood/various Halloween functions. Will was the only one I saw around here too! I’ve seen others in bloggy friends’ pictures though! First- the comparison picture is KILLIN’ me! So adorable!! Second- Daniel looks just like Kalena when she cries! Crazy. I think my kids all have the same sad face. Ridiculously adorable! I especially like the comparison picture. I am starting to enjoy Halloween a lot more now that it’s something fun to do with Katja rather than just handing out candy and trying to keep the giant dog from scaring people away. 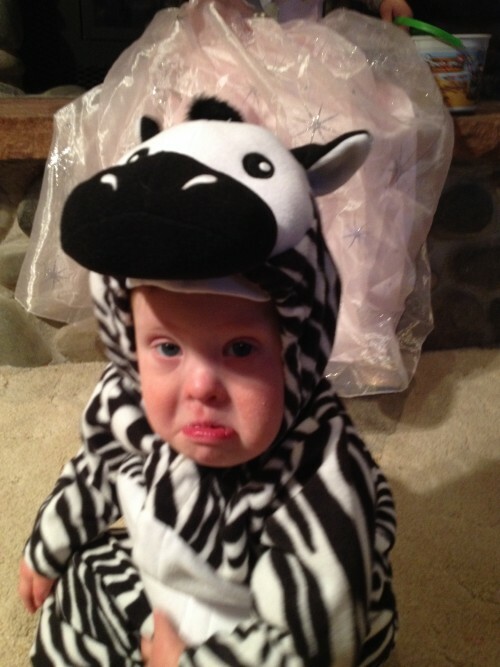 Sad zebra is the cutest! Oh my gosh that side-by-side comparison is fabulous! I love it! Great costumes! Will’s giant melon and the side by side Batgirl pictures made my DAY. I generally think Kalena looks like Brian, not me, but I can see the resemblance in those pictures! I think Daniel’s sad face is TWICE as sad, given his usual grinning face. Like, the height from which he has fallen is greater. Than anyone else who has made a sad face. In the history of the world. Poor, sad, sick zebra. It is extra sad to see him sad because it’s so rare. Oh, man. Sad zebra. Sad zebra is killing me.